This IBM® Redpaper™ publication provides information about the implementation and use of solid-state drives (SSDs) in IBM XIV® Storage System XIV Generation 3 (Gen3), running XIV software version 11.1.0 or later. In the XIV system, SSDs are used to increase the read cache capacity of the existing DRAM memory cache, and are not used for persistent storage. This paper begins with a high-level overview of the SSD implementation in XIV and a brief review of the SSD technology, with focus on the XIV system. It explains the SSD Caching design and implementation in XIV. Then it examines typical workloads that can benefit from the SSD Caching extension and introduces the tools and utilities to help you analyze and understand the workload. In particular, it highlights the block tracing facility that was designed and developed by IBM Research. Then this paper explains the process that authorized IBM services representatives use to install SSD Caching. It reviews the changes made to the XIV GUI and the XCLI to support SSD Caching. Finally this paper provides a listing of the new alert-generating events and monitoring options that are provided for SSD support. This paper is intended for users who want an insight into the XIV SSD Caching implementation and architecture, its capabilities, and usage. 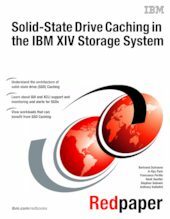 For more information about the IBM XIV Storage System, see the IBM Redbooks® publication, "IBM XIV Storage System: Architecture, Implementation, and Usage," SG24-7659.